Hibiscus trees produce large, stunning blossoms in various bright colors. This tree comes in tropical and cold-hardy varieties. Tropical hibiscus (Chinese hibiscus), or Hibiscus rosa-sinensis can reach mature heights ranging from 7 to 12 feet with spreads from 6 to 10 feet wide, and grow best in USDA hardiness zones 9 through 11. Cold-hardy hibiscus (Rose-of-Sharon, Shrub-Althea), or Hibiscus syriacus can reach full-grown heights from 8 to 12 feet tall with canopies ranging from 4 to 10 feet, and grow best in USDA hardiness zones 5B through 9A. Caring for a hibiscus tree begins at planting. Plant your hibiscus tree in a location large enough for the mature size. Select sites in your yard providing well-draining soil and full sun to partial shade. Dig a hole equal to the depth of the container holding the hibiscus tree and at least twice as wide. Carefully remove the hibiscus tree from the container and inspect the root ball. Cut away any weak or damaged roots found and straighten out any tangles. Place the hibiscus tree in the hole and backfill with soil. Saturate with water to compact the soil around the transplanted hibiscus. Cover the area under the hibiscus tree’s canopy with 3 to 4 inches of mulch. Keep the mulch away from the hibiscus’s trunk. Replace the mulch as needed yearly, extending it out as the tree matures. Water the growing hibiscus often during the first season, and less often once established. The amount of water needed will vary depending on rainfall, your location and other factors. Check the top few inches of soil every few days and saturate the soil with water when it is dry. 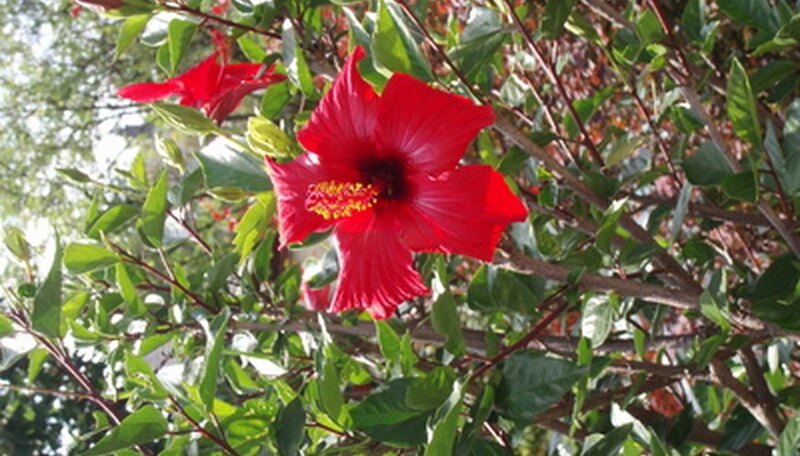 Supply a standard fertilizer such as 10-10-10 or 20-20-20 during the growing season of the hibiscus tree. Follow the fertilizer’s directions for amounts and times to apply, and keep the fertilizer off the hibiscus tree. Prune the hibiscus tree only as needed to maintain a specific shape, if you so desire. Remove any diseased, broken, frail or touching branches at any time. Pinch off the tips of the emerging branches to encourage more flowers. Grow hibiscus trees in containers and move them inside during the winter, if you live in any area outside of the recommended USDA hardiness zones. Does a Hibiscus Tree Like Sun or Shade?